According to V8 Supercars, Mostert was on his first lap of the forty-minute qualifying session when he tapped the wall inside turn 16, crashed into the wall at turn 17, and then hopped the wall and slid for some time towards turn 18 (“Forest Elbow”). Dr. Le serves as V8 Supercars’ permanent medical delegate. Fox Motorsport reports that one marshal from the stand that was hit by Mostert’s car also sustained a knee injury in the crash, however, the status of the other two marshals is unknown. 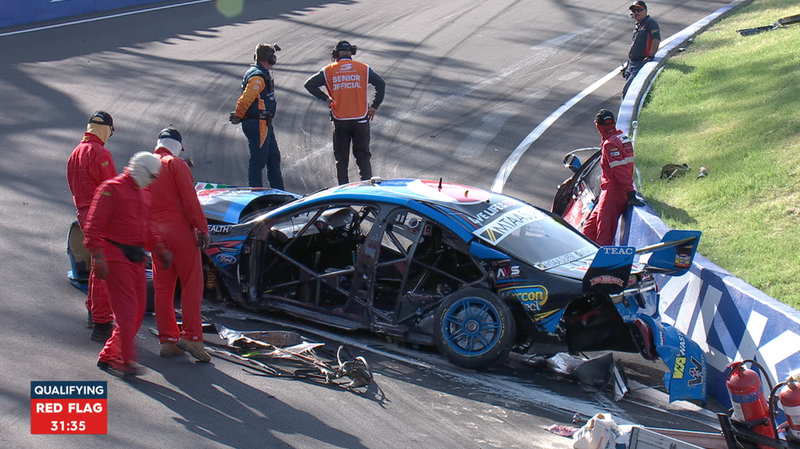 After this crash, V8 Supercars suspended all on-track activities for the day. Mostert won last year’s Bathurst 1000 sharing a car with Paul Morris. UPDATE [2:18 a.m.]: V8 Supercars has confirmed that five marshals were injured in the crash. Four sustained minor injuries, and one was taken to the hospital in stable condition. Furthermore, Mostert fractured his left femur and left wrist in the incident. UPDATE [2:33 a.m.]: Fox Motorsport reports that none of the marshals sustained head injuries in the crash. UPDATE [11:20 a.m.]: Motorsport.com confirms that none of the injuries sustained by the marshals were life-threatening. The marshal who was transported via road to the Bathurst hospital sustained chest injuries in the crash. UPDATE [2:09 p.m.]: V8 Supercars reports that Mostert is in good spirits this afternoon. “Thank God we signed that contract a couple of months ago!” said Mostert to Edwards in the Mount Panorama medical center, as quoted by V8 Supercars. He is in good spirits, but I think there is a bit of green stick (pain killing drugs) in that. He is thinking of the team and very apologetic to the boys who put in all the hard work to get him out on the track. But it was good he was able to joke and I am happy to let everyone know about it. Qualifying has been rescheduled for 12:30 p.m. local time (AEDT) tomorrow (9:30 p.m. EDT) and will consist of a thirty minute session ahead of the Armor All Top 10 Shootout at 5:10 p.m. AEDT (2:10 a.m. EDT). Full details can be found here. V8 Supercars also reports that the hospitalized marshal has been cleared of neck, chest and brain injuries. Mostert is undergoing surgery on his left femur today, per V8 Supercars’ latest report.